After a whirlwind July that saw four films open in excess of $50 million, we settle back into the box office doldrums of August. 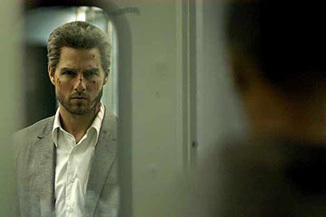 DreamWorks attempts to give one last hurrah, though, with the Tom Cruise-starrer Collateral. It's not a bad ploy, either, as Cruise may be the surest draw in the business today. Much of Cruise's success is due to remarkably savvy decisions with regards to the projects he chooses. If he went the quirky route of Tom Hanks in Ladykillers or the more independent-minded road of George Clooney, Cruise would probably have a significantly higher number of misses on his resume. With the exception of Magnolia, Cruise seems to select movies that have an outstanding chance to both please reviewers and appeal to a wide-ranging demographic that drives the box office both in the short and long-term. His latest project is certainly no exception to that rule, as Cruise has teamed with stylish director Michael Mann for a film that enables him to take on the rare role of "villain." It's a bold decision but probably a good one. Though Cruise typically portrays the hero, enabling him to put his All-American looks and sometimes inexplicable charisma to good use, he was wickedly engaging as the nasty piece of work Lestat in Interview With the Vampire. Seeing him go back to a similar sort of character - evil but somehow likeable - is appealing on its own. Adding Mann's flashy technique to the mix only sweetens the deal. Left as a sidenote is Jamie Foxx, who will probably be receiving a lot more attention for his portrayal of Ray Charles in a couple of months, anyway. Collateral has gotten a substantial marketing push and is already receiving mostly positive reviews from critics. Even so, it doesn't have quite the "event film" feel of recent huge openers like I, Robot, The Bourne Supremacy and The Village. As such, I see it opening lower than those previous big dogs but sustaining a bit of staying power as buzz spreads. Look for $35 million from Friday-to-Sunday and a successful outing for Cruise, Mann and Foxx. Almost relegated to sideline status is the Brittany Murphy romantic comedy Little Black Book. While I personally have seen tons of trailers and commercials for Collateral, I have yet to see one for Murphy's film. Perhaps the best basis for comparison is the fact that she had a movie debut in almost exactly the same time frame in 2003. Uptown Girls opened on August 15, 2003 to $11.3 million. I believe we can anticipate very similar results for Little Black Book, though this latest flick might even trend slightly lower. A Friday-to-Sunday result of $11 million would be right in line with expectations for Sony/Revolution Studios. This weekend, watch for The Village to suffer the same outrageous drops that have been the trend for all blockbusters this summer, while The Manchurian Candidate should show the typical staying power of a Denzel Washington film - especially such a well-reviewed film as this one.